Department of Women Affairs Career Requirement Notice 2018. Bangladesh Ministry of Women and Children Affairs and Department of Women Affairs together will be published this Requirement notice. As a Result, www.jobscircular24.com found this Jobs Circular here. Recently Government of the People’s Republic of Bangladesh Department of women Affairs found this Requirement notice 2018. 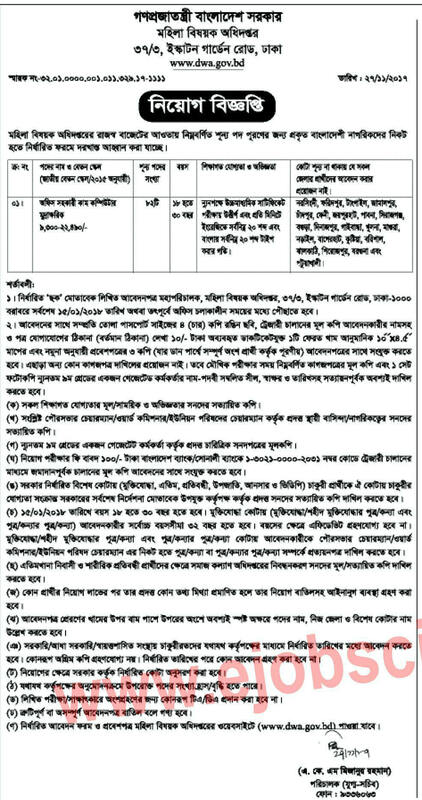 DOICT Jobs Circular If you want to download this circular can be download here. Male and female are both can apply this circular. We will be given DWA Jobs Circular 2018 exam result here. We also will be published this job seat plan, DWA Exam Date 2018, DWA exam result 2018 and more updated information can be download here. Bangladesh Ministry of Women and Children Affairs Job Circular 2018 Most important information are Given below. Requirement Position: This job position is 3rd and 4th class employees of Department of Women Affairs Bangladesh under the Ministry of Women and Children Affairs. Salary: As per Government Pay-scale. First Download these jobs application form which forms we are given here. After Download this jobs form please fill up carefully and submit this information which addresses given this image. Apply with full Resume to Director General, Department of Women Affairs, 37/3, Easton Garden Road, Dhaka-1000. DWA Jobs Circular 2018 exam result 2018 will be found my website. When will be found this exam result same time we will be upload here. As a Result dwa exam Result 2018 can be download easily here. We also will be found this jobs exam preparation and exam date seat plan here.